Mukteshwar is a famous tourist spot situated at an elevation of 2285 metres above sea level in Nainital district of Uttarakhand. It is 51 km away from the Nainital city. The place gets its name from a 350-year-old temple dedicated to Lord Shiva, situated on the highest point in the town. It is believed that Lord Shiva killed a demon here and granted him salvation/Mukthi. Mukteshwar offers a panoramic view of the beautiful Himalayan range. Mukteshwar is encompassed by orchards and coniferous forests. It has subtropical highland climate and is fast becoming a favourite tourist destination among those who would like to avoid crowded hill stations like Simla or Manali. Pantnagar Airport, at a distance of 94 km, is the closest airport to Mukteshwar. You can find taxis plying to and fro from the airport to Mukteshwar. Kathgodam Railway Station is situated at a distance of 62 km from Mukteshwar and is the closest railhead. There are two trains that run daily between Delhi and Kathgodam. 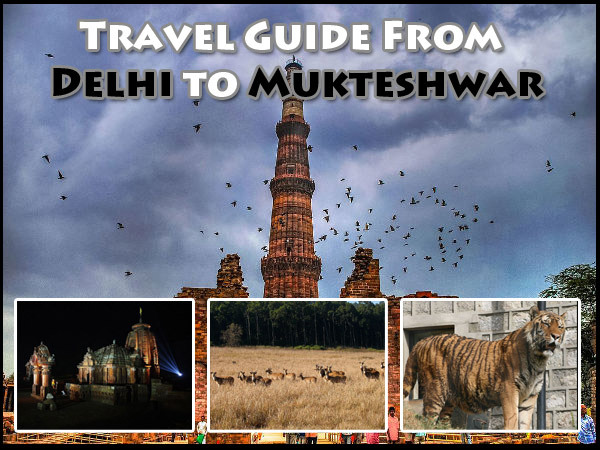 You could take any of the two routes that are mentioned below from Delhi to Mukteshwar. Route 1: Delhi - Ghaziabad - Moradabad - Rampur - Nainital - Mukteshwar, via NH 9. This takes 8 hours to drive down and is approximately 347 km. Route 2: Delhi - Faridabad - Aligarh - Bareilly - Haldwani - Mukteshwar, clocking 10 h 30 min on SH 33. This is 475 km or thereabouts. Route 1 is the shortest and also takes lesser time than Route 2. Leave Delhi early in the morning to avoid getting stuck up in the traffic and reach Ghaziabad. You can visit Dudheshwarnath Mandir, Durga temple and ISKCON temple in Ghaziabad. Moradabad, situated on the banks of the river Ramganga is called "Pital Nagari", which means "Brass City". You can pick up brass lamp shades, vase, furniture or other decorative items from here. The deer park here is a must visit if you have little children with you. If you are a wild-life enthusiast, then you can invest some time in visiting the Jim Corbett National Park. Please be aware that this involves a detour and a rather long one. Corbett National Park, one of the oldest national parks in India, is known for its Bengal Tigers, apart from the rich diversity of flora and fauna. You can book a safari and spot the majestic wild animals like leopard, tiger, elephant, etc. There's also an option for an elephant safari, which is offered if you book a jeep safari. Bird watching is also famous here, with Corbett being home to more than 650 species of resident and migratory birds. Next, you can stop at Nainital before heading towards Mukteshwar. This city is set around the pear-shaped Nainital lake, bound by hills on all sides. The cable car ride to Snow View Observation Point to view the panoramic Nanda Devi peak, China Peak, etc., and other snow-clad mountains is a must do. Eco Cave Garden is a show stopper with children, where they can learn all about the ecosphere. Nainital Zoo is a popular tourist spot where you can find rare species of snow leopard, steppe eagle, and Himalayan black bear. Also check out Kilbury, which is a bird watcher's paradise. Once you reach Nainital, the lush green valleys, the beautiful colours on trees and the sweet fragrance of the flowers will keep you company till Mukteshwar. Next stop is our destination - Mukteshwar. Mukteshwar Temple: This temple, around which this whole town is based, is one of the 18 very important Shiva temples. The temple does not have grand architecture - it is simple. This little temple is set at a great height looking down at rich green valleys. Chauli Ki Jali: Also known as Chauthi Jali, this is located behind the cliff of Mukteshwar temple, at a distance of 250 metres. "Chauli" means rock and "Jali" means hole. Grey rocks extend out of the moss-covered green hills into oblivion. This place is very famous for its sunsets and sunrises. You can also indulge in Mountain Climbing and Rappelling here. Dhanachuli: This is another hill station in close proximity to Mukteshwar. Beautiful Himalayan landscapes are visible in the winter period from October to March. IVRI: The Indian Veterinary Research Institute was developed by the British and it is one of the leading advanced research facilities engaging in live-stock research. There is a museum inside the campus, where some of the treasures like Nobel Prize-winning scientist Robert Koch's microscope is housed. You can also visit the newly developed 'Renewable Park' by TERI in Mukteshwar.